Companies that deal with intellectual property services can better manage inventions, patents and new products with this free, printable business plan. COMPANY NAME is a small company that manages the inventions of INSERT NAME. INSERT NAME(S) have invented a INSERT PRODUCT, with four adult models and five children models. The patent is pending. • Pay for the U.S. patent proceedings, foreign patents, and accrued and future legal fees. The above projections for sales are partially dependent upon the size of grant received. 1. Obtain U.S. and foreign patents for the INSERT PRODUCT. 2. Sell license to a large company. 3. Hire a CAD designer full-time. 4. Expand the line of inventions. The company's mission is to invent, create, patent and bring to market, innovative and unique products with quality and affordability in mind. COMPANY NAME is an invention holding company that was established in September 2008, is located in CITY, and is co-owned and operated by INSERT NAME(s). The principals invented INSERT PRODUCT which covers every stage of life, from children to adults. All of the INSERT PRODUCT(S) are multifunctional. They have four adult models and five child models. The adult line gives a person the choice of a very basic model to a power model. The child line of INSERT PRODUCT looks like toys. This is done in order to make it fun. This company plans to continue to invent other innovative and unique products in the dental industry and other industries. COMPANY NAME is organized as a sole proprietorship and is owned 51/49 by COMPANY NAME(s). COMPANY NAME was founded in 2008. This appears to be the first invention that the principals have pursued vigorously for patents and funding. The firm has not produced any historical revenue. The company has had $8,925 in expenses in 2008 and $29,452 in 2009. These funds came from the principals' savings and from family members. COMPANY NAME has invented a INSERT PRODUCT. There are presently nine models, with four being adult models, and five being child models. All of the INSERT PRODUCTS are attractive and multifunctional. The products can be sold to dental offices and retail stores. INSERT MODEL will retail for $6-$8 and the INSERT MODEL will retail for $10-$12. The business will be able to sell to dental offices and retail stores. There were 181,725 active dentists in the U.S. during 2007, 57 accredited dental schools in the U.S., and during 2007-2008 there were 19,342 students enrolled in post-graduate dental schools (per ADA statistics). The firm will benefit from two growing trends in the U.S. population: Americans are more health conscious and increasingly understand how dental health is related to heart health. In addition, during this recession, Americans have become more conscious of value and spending money wisely. DISCLAIMER: The business plans, templates, and articles contained on BusinessPlanTemplate.net are not to be considered as legal advice. All content is for informational purposes, and Savetz Publishing makes no claim as to accuracy, legality or suitability. The site owner shall not be held liable for any errors, omissions or for damages of any kind. This template is easy to download and print. 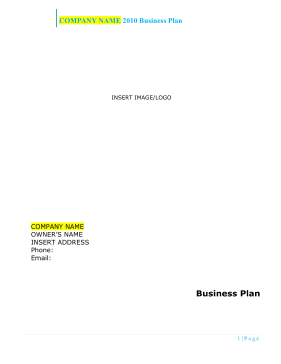 Each free business plan template is available in Microsoft Word (DOC) format, and many of the Business Plan Forms are available in Excel (XLS) format as well. Just choose a business plan template and download it. Open it in Word or Excel (or another program that can display the DOC or XLS format), edit it, and print your personalized business plan. If you don't see a template design or category that you want, please take a moment to let us know what you are looking for.